2005 Kendrick Rd - 3 Bedroom Home on 20 Acres in TN for sale with Shop & Big Shed!!! This Luxury Country Home is located in just down the road from Pickwick Lake & Shiloh National Park. Over 4,000 sq.ft. Under Roof, 3 Bedrooms, 3 Baths, Separate Office, Attached 3 Car Garage, Big Shop, RV or Boat Shed, and 20 Acres of Beautiful Gently Rolling TN Land for sale!! Make this Perfect Mini Farm yours, call today! Very Private Setting with the Home in the Middle of the Property! This Home has loads of features, which include some of the following. 3 Bedrooms, 3 Baths, Everything on 1 Level, Approximately 3,100 sqft Heated Square Footage, Over 4,000 sq.ft. Under Roof, Covered Back Porch with Hot Tub, Open Pea Gravel Patio in Back, Beautiful Natural Wood Finishes throughout the Home, High Vaulted Ceilings, Nice Wood Lament Floors, Large Dining Room Open to Kitchen, Large Custom Kitchen with Solid Stone Countertops, Breakfast Bar, Nice Appliances, Stand Up Refrigerator & Stand Up Freezer Both in Kitchen, 2 Separate Pantries, Sizeable Living Room with Gorgeous Corner Gas Fireplace, Huge Master Suite with Extra Big Walk-In Closet, Master Bath with Jetted Tub & Separate Shower & Linen Closet, Sitting Room/Work Out Room in Master Suite with Door to Back Porch, Sun Room, 2nd Master Bedroom with Walk-In Closet & Private Bath featuring a Jetted Sitting Tub & Separate Shower & Linen Closet, 3rd Bedroom is 15x12 with Walk-In Closet, Large Laundry Room with Closet & Sink & Extra Counter Space, Back Entrance way with Closet, Separate Office with Double Closet & Bay Window that could be 4th Bedroom if needed, Permanent Attic Staircase, Floored Attic Space and Peg Board Walls, Very Large 3 Car Garage with Finished Walls & Storage Area with Peg Board Wall, and this Lovely Home was Built in 2010. The 28x24 Metal Shop has High Ceiling with Electricity and 2 Roll-Up Doors and 1 Man Door. The Shop has 220 wiring for whatever you may need. The whole Shop has Concrete Floors and located just a few steps from the 3 Car Garage. This Shop is Great and will handle just about all of your Man Cave needs. The Land is nearly all Level with some slightly Gently Rolling with a couple of Acres of an old Gravel Pit which is very handy for do it yourself projects. 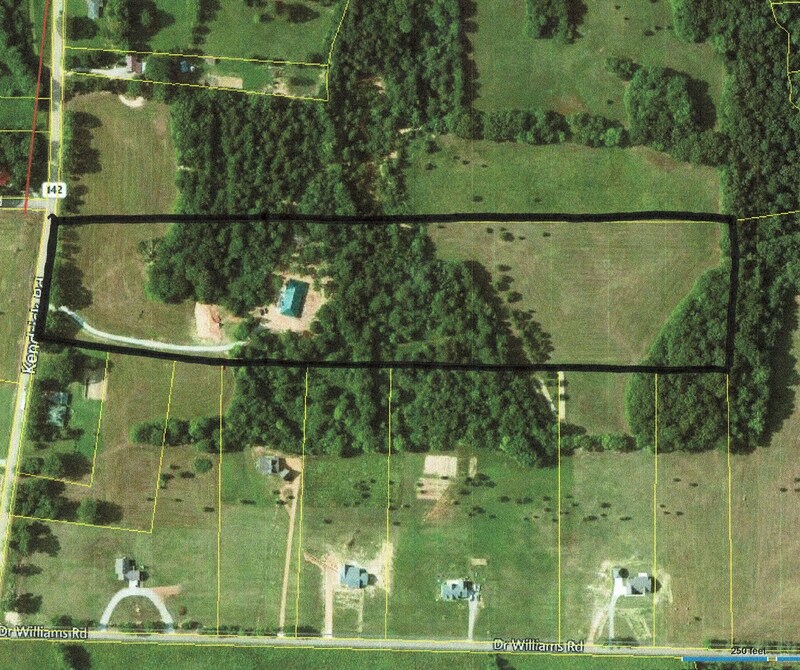 The Property has about 10 Acres Open Land and about 10 Acres of Wooded Land. If you want the perfect Country Home that is Like Brand New, then give us a call today!